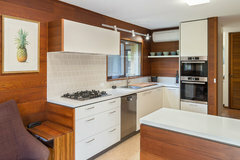 We have recently renovated our kitchen in a fairly run down mid century modern style house. I am keen for advice on the best tiling option. The original colour scheme of the house and kitchen is very much white, mission brown and timber. I'm wanting to maintain some of the original feel and am wondering which tiles to use. I will share photos of our current top three below. Thanks in advance! Can you post a pic of the kitchen? There are lots of "flavours" of mid-century kitchens as this period ran over a number of decades. Have a look at some of my Pinterest resources to help match your kitchen style and tiles. Which style era could you never have in your house? Industrial style kitchen tips and styling ideas.